Chinese currency could become the new petro-dollar. 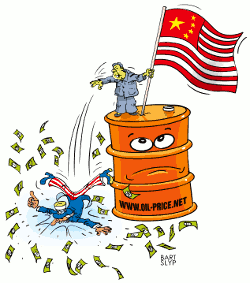 Last month Marconi's article here in oil-price.net broke the news of how China was building its crude oil reserves, completing 102 million storage facilities and how the country had a big devaluating pile of dollars. Well, trusted sources say that China has taken the next step to woo the Arab countries and establish closer relations. Until now, the US dollar has been used as the sole oil trading currency around the globe. But last weeks rumors started to surface that a secret meeting took place between Gulf Arab oil producers and some oil importing states trying to decide on an alternative currency to dollar for transactions. Spearheaded by China, the meeting has proposed to trade oil in a basket of currency including, the Euro, Chinese Yuan, Japanese Yen, gold and a new currency to be planned by the GCC (The Gulf Cooperation Council-Saudi Arabia, Kuwait which already went off the US dollar two years ago, Qatar, and Abu Dhabi). But why are Arab countries lending a kind ear to China? Look no further than the U.S, invasion of Iraq. With an estimated one million Arab deaths resulting from the US invasion, anger is simmering throughout the Arab world, not just Iraq. The bad publicity gained has helped an enthusiastic China in a big way. China is in need of huge amounts of oil and the Gulf States are happy to comply with China in exchange cheap imports, military technology transfer. This pushes the US further aside from the bargaining table and reduces its influence in the Middle-East. This scenario is far removed from the Nixon Shock of 1971, if one were to walk the lanes of history. In 1971 the then U.S. President, Nixon, cancelled the direct convertibility of the dollar to gold. During the same period Oil production in the US peaked and the country ran out of capacity to increase the production. OPEC (The Organization of the Petroleum Exporting Countries) thus steps into the picture. Nixon's move helped the US to print more dollars- as much as they needed- to buy oil from OPEC establishing direct nexus between the dollar and oil. So, here's the bigger picture: When this dollar dominance ends, as efforts are already visible, it could well be the last shoe to drop from the US economy.